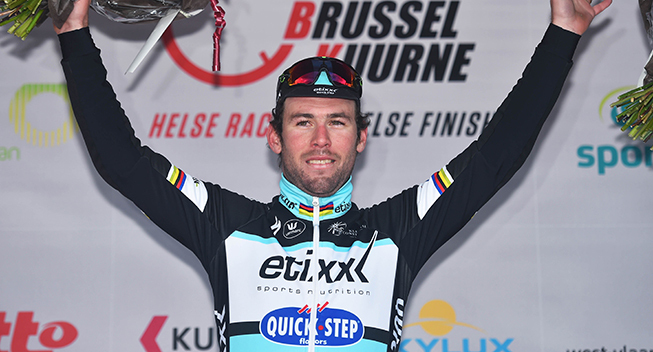 Mark Cavendish (Etixx-QuickStep) continued his recent run of success when he took a hugely dominant win in the first stage of the Tour of California. Having been perfectly delivered on the front by Mark Renshaw, he easily distanced Peter Sagan (Tinkoff-Saxo) and Jean-Pierre Drucker (BMC) to take both the stage victory and the overall lead. Last year Mark Cavendish returned to the Tour of California after a short absence and lined up at the race on the back of a very successful Tour of Turkey where he had won four stages. This year he is back in the biggest American race and again he has come straight from Turkey with lots of success in his pocket. 12 months ago Cavendish opened the race with a great performance as he won the opening sprint stage in Sacramento. Today he went into the same stage with a similar plan and he didn’t disappoint his fans. After his team had controlled the race throughout the entire stage and made sure that Cavendish stayed safe in the windy conditions, Cavendish was clearly the fastest when the race came down to the expected bunch sprint. Again he was given a near-perfect lead-out by Mark Renshaw and when he launched his sprint, no one was even close to matching his speed. With 8km to go, the early break had been brought back and Tinkoff-Saxo had taken complete control, with Michael Mørkøv and Maciej Bodnar settingt the pace while the sprint teams were fighting for position. With 6km to go, MTN-Qhubeka took over with Gerald Ciolek leading Matthew Goss, Tyler Farrar and Theo Bos. Ciolek realized that it was too early and when he slowed down Etixx-QuickStep took over with Stinjn Vandenbergh. The Belgian swung off at the penultimate passage of the line where Velits took over. A Hincapie rider hit the front to give the Etixx riders a small breather before Matteo Trentin hit the front followed by Yves Lampaert, Mark Renshaw and Cavendish. However, they lost the battle to Giant-Alpecin when Warren Barguil hit the front. Michael Schär made a big surge to take the front and this forced Trentin to work hard to bring the Swiss back. Trentin led the peloton under the flamme rouge with four of his teammates behind him. Julian Alaphilippe was next on the front but he was passed by Daniele Bennati who brought Sagan into position. The Slovakian moved onto Cavendish’s wheel just as Renshaw launched his lead-out. From there Cavendish made his famous kicked and he immediately gained a few metres on Sagan who could do nothing but trying to follow and hold off Jempy Drucker in the fight for second. With the win, Cavendish also takes the first leader’s jersey with a 1-second advantage over William Clarke (Drapac) who was in the early break. He has a great chance of defending that position as stage two is a long, gradual downhill run to a completely flat finish where another bunch sprint is expected. The 10th edition of the Amgen Tour of California kicked off with203.1km stage that started and finished in Sacramento. The course was almost completely flat and ended with 3 laps of a flat 3.2km circuit in the big American city. The riders had great weather condition when they gathered for the start and it is often the case in the big American stage race, they got the race off to a very fast start. A 6-rider break first got a gap and when they were brought back, William Clarke (Drapac), Steve Fisher (Jelle Belly), Rob Britton and Robert Sweeting (both Smartstop) took off. The peloton finally took a small breather and after 13km of racing, the escapees were already 1.30 ahead. After 22km of racing, the gap had gone out to 3.10 and it reaching 4 minutes before Etixx-QuickStep hit the front. At the 45km mark, it was 6.25 and it reached a maximum of 6.40 a little later. Smartstop tried to use their numerical advantage in the first intermediate sprint but they were beaten by Clarke who held off Britton and Sweeting. At this point, the gap had come down to 6.10. Clarke was again the fastest in the second sprint while Britton and Fisher took the minor positions. Meanwhile, Lucas Haedo (Jamis) fought his way back from a puncture. As the escapees reached the feed zone with 122km to go, the gap was 5.10 and it was still Etixx-QuickStep doing the work. The pace was upped as they hit a dirt road section and so the gap continued to come down. Danny Pate (Sky) was one of many riders to puncture at this point. Moments later the riders hit a crosswind section which split the field, with 15 riders losing contact. At this point, one of the overall favourites Andrew Talansky (Cannondale) abandoned due to a respiratory infection. Due to the windy conditions, the peloton was riding very actively and when they turned into a headwind with 100km to go, the gap was only 3.15. Meanwhile, Mike Teunissen and Robert Gesink (LottoNL) were among the many riders to suffer punctures. The headwind calmed things down and so the gap stabilized around 3.15 before the rider turned into a tailwind with 75km to go. That was the signal for MTN-Qhubeka to join Etixx-QuickStep on the front of the peloton and it was now Guillaume van Keirsbulck (Etixx-QuickStep) and Mattthew Brammeier (MTN-Qhubeka) riding on the front. Britton suffered an untimely puncture and this spelled the end for his time in the break. With 60km to go, he was back in the fold. At this point, the gap was still 2.50 but now Hernandez, Van Keirsbulck, Velits and Brammeier gradually upped the pace. With 45km to go, they had reduced their deficit to 2.05. 4km later the peloton again turned into a crosswind and this made the peloton significantly more nervous, with several teams lining up their squads on the front. That brought the gap down quickly and with 35km to go, it was just 1.15. At this point, Theo Bos (MTN-Qhubeka) had to stop due to a mechanical and he had to work hard to rejoin the peloton that was still marred by a big fight for position. However, the bunch now calmed down and so Van Keirsbulck, Hernandez and Brammeier went back to work, allowing the gap to grow to 1.40 as they entered the final 25km. Jonathan Freter (Jelly Belly) was involved in a dramatic solo crash but luckily he escaped the incident relatively unharmed. While he chased back, the chase again got serious as Velits again joined forces with the three domestiques on the front and Matti Breschel started to work for Tinkoff-Saxo. With 20km to go, the gap was down to a minute and here the bad luck continued for MTN-Qhubeka. Tyler Farrar suffered a puncture and had to spend a lot of energy to rejoin the peloton. The gap was melting away and just 2.5km later, it was down to 20 seconds. The escapees were digging very deep as they tried to get to the final intermediate sprint with 15km to go and that paid off as Clarke managed to lead Sweeting and Fischer across the line. Brammeier had now finished a day of hard work while the sprint trains started to gather behind Breschel, Velits, Van Keirsbulck and Hernandez. Meanwhile, Fisher was dropped from the breakaway. With 12km to go, the gap was still hovering around 20 seconds and now Sweeting tried to attack in an attempt to become the most aggressive rider. However, Clarke was quick to respond. Tinkoff-Saxo now took complete control of the peloton as they lined up their team on the front, with Breschel and Maciej Bodnar setting the pace. They didn’t respond when Kiel Reijnen (Unitedhealthcare) attacked and he quickly bridged the gap to the leaders after Sweeing had made another attack. Passing the finish line for the first time, Reijnen passed the two early escapees who were both brought back by the Tinkoff-Saxo team. With 8km to go, it was also over for Reijnen.